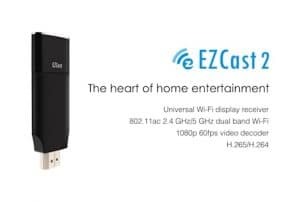 If you are looking to wirelessly cast or stream a movie or any content from your laptop, PC or any Windows and Android Why device EZCast 2 is the device for the job. The EZCAST2 USB wireless adapter plugs directly into your USB port on your TV and will turn it into a Smart TV. Its fast and easy to setup. It allows you to stream video from your Windows and Android device direct to your TV Screen. Ezcast2 works on Apple Mac and Windows Devices. EzCast2 allows you to easily download an App to your device and then cast or mirror content to the EZCast 2 wireless device. The setup guide is simple and support is excellent. Using an EZCast 2 wireless adapter means you can save money on cable subscription fees. You can now use your mobile phone and laptop to enjoy your home entertainment.